The days were slowly passing by since I sent my manuscript off to the publisher on December 1. At first I put the entire idea of being published out of my mind. I had gone away for a weekend to write the manuscript and put so much of my normal family and life commitments on hold as I worked toward the manuscript deadline. So naturally after I sent the manuscript into the publisher, I felt a tremendous sense of relief. I met my goal. I wrote the story. I celebrated. Then I filed it in the back of my brain and jumped into the thick of the holiday season. Then one week passed by, 2 weeks, 3 weeks. As Christmas approached I hoped that maybe there would be a Christmas gift in my email. On December 22, I did receive an email from the publisher. The subject line read: Christmas Gift from Cladach. My heart skipped a beat. I opened the email with much anticipation only to be immediately let down by the reality that this was a marketing email to announce a free e-book that the publisher was offering. It was a nice Christmas promotional idea, but my hopes were dashed. And there it was again—right in the front of my mind. This email seemed to trigger all of my doubts about going down this path and if I really could be a writer. I had put myself out there. I had written what was on my heart to write—the story that I felt God calling me to write—and it came back void. I felt exposed. I was already in a writer’s funk and not writing on my blog. There was nothing I could physically do about it, so I worked on letting go of my fears and doubts emotionally again. The New Year brought renewed hope for me. I attended my monthly Christian Writer’s meeting and started to think about setting some writing goals for 2012. I decided to hold on to the belief that this piece would be published this year—if not by this publisher then by another. So many people had witnessed this story unfold and told me how amazing it was. So many people had been inspired by it. So many people said they couldn’t wait to read about it. God was definitely telling me to pursue it. I trusted Him with this story and again put it in the back of my mind. As a beginning writer, I was learning how difficult the waiting part of this process was. I definitely wasn’t looking forward to the potential rejection that commonly follows. I knew that the two month milestone would be pivotal to me. It is at that point, that a writer usually contacts the publisher if they haven’t heard. A few days before the two month anniversary, I watched the movie “The Help” again. The first time I saw it, I was just starting to see myself as a writer, so Skeeter’s journey to become a writer really resonated with me. This time around I watched the bonus feature about the making of the movie. The bonus video clip told the story about how the book debuted on the New York Times Bestseller list and the impact it had on Kathryn Stockett, the author’s, life. She was with friends when she got the news and immediately they marked this moment in time (with a toast) as an event that would forever change her life. I got goose bumps when I saw this video clip. I sensed that I was moving toward this event in my life too. I felt encouraged and wrote about this in my journal. I felt poised for success. I was on pins and needles. The following day, the much anticipated contact from the publisher arrived. The subject of the email was the reply (RE) to the original email I sent with my manuscript. I knew as soon as I saw it that it was the long awaited answer. I let out a scream and held back on opening the email. I received it as I was on my way to an appointment. I delayed opening the email until later in the day when I wasn’t so rushed. After I returned from my appointment, I prepared myself by spending some time in prayer and surrendering the outcome to God. The email reply was short—just one line. I immediately thought it was a rejection. I had a friend on speaker phone with me to share this moment. I read the line silently and then began screaming—and crying. “What, what, what?” my friend asked. “What does it say”? “They’ve accepted my story!” I shouted through tears of joy. “They are sending a contract!” My sheer joy elicited excitement from her as well. The house was filled with a mixture of shouts, laughter, and tears. My son rushed downstairs to find out what all of the commotion was about. He thought that something terrible had happened. I told him the good news and held him in a big hug for a long time letting all of the emotion release from my body. This excitement was followed by emails to the publisher, my husband, my prayer partners, my writing teacher, and of course, Rosa and Pedro in Spain. Later that evening, I attended my regular support group meeting and let the tears flow some more. The timing was so perfect with the anniversary of my mother’s passing just one week away. This day was also the 8-year anniversary of the devastating event that led me to start recovery in the first place. God had perfectly redeemed this day for me into something with such a positive nature. 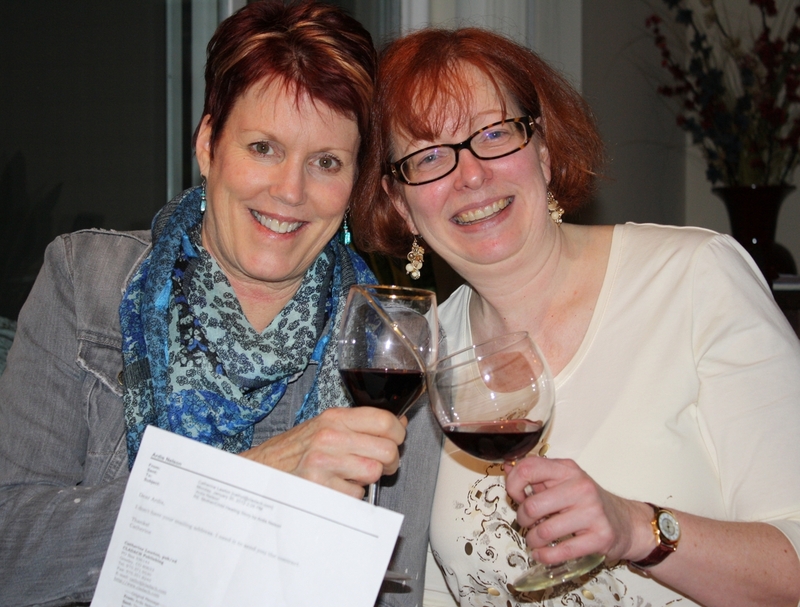 The icing on the cake that night was celebrating and toasting this occasion with my friend at her house. It was like déjà vu. Just like Kathryn Stockett, the author of “The Help,” my life was taking a potentially dramatic change. We were marking this date as a milestone in my life and thanking God for His blessing. I know my writing isn’t Pulitzer quality and that I am only one of eight authors in this book. I also know that this was only possible because it is God’s will. My waiting for this news wasn’t just something that was two months in the making. This is part of the bigger story about how God redeems years of heartache, depression and loneliness. It is the restoration for the years that the locusts have eaten (Joel 2:25). The really cool thing about this is that this story is not done yet. God is at work in my life. He is at work in Spain. He is at work in the Protestant Church and the Catholic Church. God is at work all around us. He is for our good if we surrender to His will. That is the message of this story. I’m no longer on pins and needles about the publishing of my manuscript. However I am still on pins and needles on what lies ahead. It is a quiet tension inside of me that I need to get used to as I live a life where I often struggle to put God first. When I do, He is graciously waiting for me. Update 8/24/2012: My story, “Walking My Mother Home”, was released in “Journeys to Mother Love” by Cladach Publishing. Autographed copies are available on my site.